All transactions are safe and secure with a reliable history in online purchasing behind each of our associates. 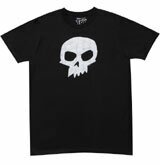 Buy the Sid's Skull t-shirt to own Toy Story clothing and merchandise. Not everyone is as nice to their toys as little Andy; there are some kids out there that intentionally mutilate their toys like Sid. This is the skull shirt Sid wore in the movie. Not only is this Toy Story tee great for everyday use, it could also be used as a costume. Wear it while some of your friends don other Toy Story costumes like the Buzz Lightyear costume below for an amusing group theme. In addition to the Sid's Skull tee above, browse the Toy Story Clothing Gallery for more apparel like men's and women's clothes, kids shirts or hoodies.